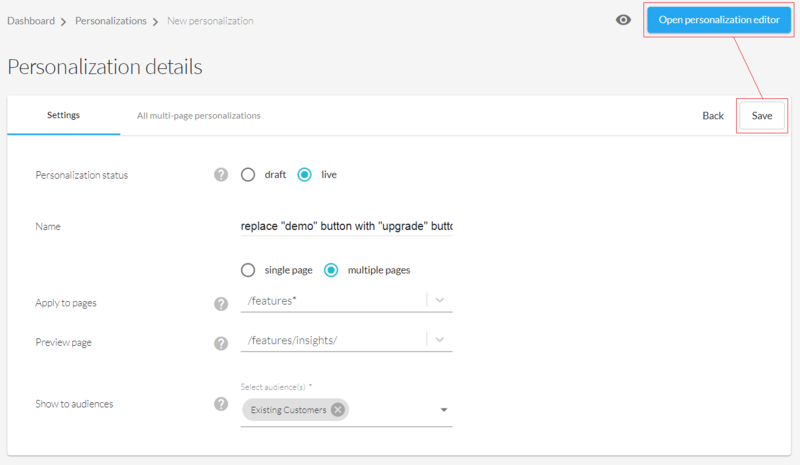 Learn how to apply the same personalizations across multiple pages. Hide the "Subscribe to newsletter" box across the website for all existing subscribers. Display a phone number in your footer for visitors from the U.S.
Swap out the "call us" CTA in your navigation for a "request demo" CTA for all visitors who arrived from an ad campaign. Display a "20% discount" overlay on all product pages for returning visitors. Depending on your goal, you can choose between a Smart Add-on and an On-site Personalization. After giving your personalization a name, select the option "multiple pages" and set a wildcard. A wildcard defines on which pages your personalization will be applied. Although your personalization will be applied to multiple pages, you need to define a preview page. This page serves as a "template" for your multi-page personalization. It is the page that will load when you open the editor to style your personalization. Lastly, don't forget to select an audience. 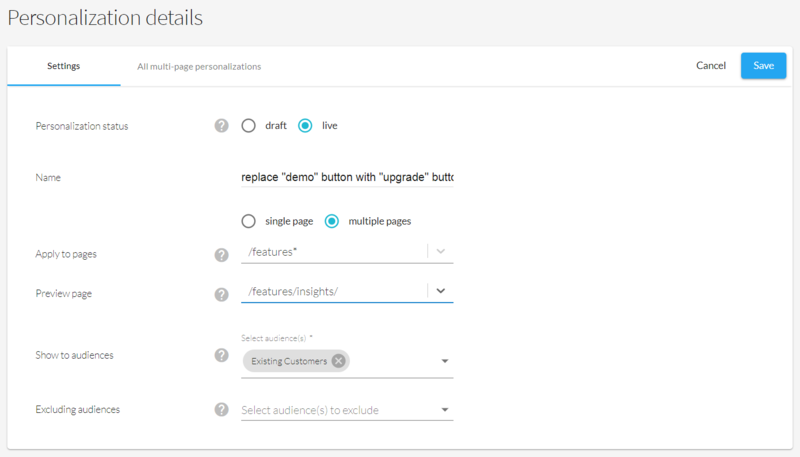 Example: We will use the page mysite.com/features/insights to edit our multi-page personalization. Our target audience are "Existing Customers". Finally, click on "save" and on "open personalization editor" to design your personalization. The new design will apply to all pages that match the wildcard pattern. To make sure everything works properly, test all the pages affected by your wildcard path.